“When the mind is silent, the heart talks. The language of the heart is love, compassion and peace. Baba Hari Das ji was born in Almora, India in 1923. Baba Hari Das ji practiced yoga his entire life. Babaji was classically trained in traditional ashtanga yoga (the Yoga of Eight Limbs). He left home at the age of eight to attend a school for young renunciates in the jungles of the lower Himalayas, and he maintained a continual vow of silence since 1952. 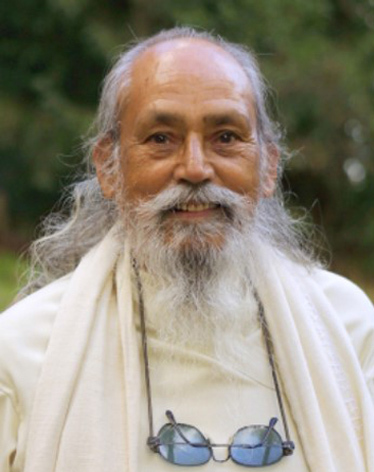 Residing in California since 1971, Babaji’s life was dedicated to passing on the wisdom of yoga, service, education and the love of children. In 1973 Babaji founded the Anath Shishu Palan Trust of India, which is dedicated to the care of orphan and destitute children. In 1984 Anath Shishu Palan Trust founded Sri Ram Ashram near Shyampur-Kangri in Haridwar district. Situated on 40 bigha of property 10km from the holy city of Haridwar, Sri Ram Ashram is a vibrant community, a living testament to Babaji’s dream of a home where children are treated with love and respect. In 1993 Babaji created Shri Ram Vidya Mandir, a CBSE school, nursery through class 12, that offers education to the children of Sri Ram Ashram and the surrounding rural area. Babaji and his teachings have inspired Mount Madonna Center in Central California and The Salt Spring Center in British Columbia, Canada. These centers are dedicated to yoga, education, and service. Babaji spent his time in writing, teaching, and in selfless service. His many books include everyday peace: Letters for Life, Silence Speaks, Sweeper to Saint as well as translations and commentaries on the Yoga Sutras of Patanjali, the Bhagavad Gita and the Samkhya Karika. The school is governed by the rules, regulations and curriculum of CBSE and is managed by the "Vidya Vikas Society Shyampur, Haridwar (U.K.)". Shri Ram Vidya Mandir School | All Rights Reserved.